What is Halakhic Minimalism? And why should you care about it? With the concept of Halakhic Minimalism, we make a few base assumptions. The Jewish people are at their best when following Halakha. The more Jews following Halakha the better. Not every Jew in every place needs to behave in the exact same way. I.e There is no one true way to follow halakha. side by side together. The country, and the Jewish people in general, are divided among themselves. community interact with one another, and most of the time, their differences are forgotten or ignored. or another, and see most other Jews only as Kiruv opportunities for our own way of following Halakah. Jews of all halakhic ways of life, are able to commingle, they are already practicing Halakhic minimalism. For every issue in Halakkah, there is a minimum requirement, a minimum cost, or a minimum impact on others. The job of the community is to enforce those minimums, accept those minimums, but also allow for others to expand upon them, as they desire for themselves. learn what the Halakhic minimum is, is to look at what the Halakhic minimum is not. Tanakh alone. The Oral Law is required as well. this. One which is obvious to the Orthodox community, is that it removes the entire concept of Halakah. that a Minimal standard is required. what is the minimal approach to Halakha? and communities rose and fell, new code books were required, such as the Mishneh Berura. It is interesting to note, that in many of these new books since the Shulchan Aruch, the process of 'best 2 out of 3' seems to be the norm. I refer to all of these different code books when I say “Shulchan Aruch Judaism”. The biggest common factor between all these books, is that they record what the customs and traditions of their communities were. Starting with the Shulchan Aruch, I would call these ways of codifying halacha as “Halakhic Maximalism”. This is not the first time this has happened in Jewish History. In the Book of Kings 1, chapter 12 verse 4, the leader of the Northern Kingdom of Israel, says to King Solomon's son, "Your father put a heavy yoke on us, but now lighten the harsh labor and the heavy yoke he put on us, and we will serve you." The result of this request, was a "doubling down", and making the yoke even more harsh, causing the the Northern Kingdom of Israel, to reject Jerusalem, the line of David, and to put up idols directed towards no god in particular, and to make Cohanim out of any tribe in Israel. The Prophets tell us that in the future, they will return to a united Israel. But if we act like Rehoboam, that will never happen. Taking these three lessons together, we can define Halakahic minimalism. Halakha must be based on the Written and Oral Torah. 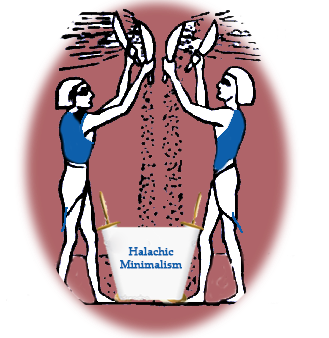 The Minimal Halakhaic position, must not be so minimal as to be non-existent. It cannot survive as a pick and choose system. Rather, we will recognize the minimal requirements, even when in practice, we would rather go far beyond them. The Halakha must be clearly sourced in the Torah, Tanakh, Mishna, Talmud Yerushalmi, Talmud Bavli, Sifri or Tosephta. We must try our best to include as many people’s practices into halakah rather than exclude. We must acknowledge the flexibility of halakhah, where it exists, (No amount of flexibility will allow us to eat a natural pig, or start a fire on Shabbat) within our own communities, not just in reference to some “other” community, that we don’t “hold by”.